Coaching for Results® gives you the tools and structure to make quantum leaps in your productivity and overall results while also increasing your enjoyment and energy in all areas of life. Designed for high-achievers, Coaching for Results® provides what is needed to break through current obstacles, whether these stem from the economy, regulatory or industry-related challenges, individual circumstances or habits. Build a personalized business-building plan with realistic deadlines. Determine which strategies to execute to improve performance and profits. Discover what you’ll need to achieve your short and long term goals. Reduce your headaches and challenges while focusing on your core strengths. Integrate your values, goals, mission and legacy into your daily activities. Maximize the use of time and energy for meaningful pursuits and pleasures. Set your plan in motion-so that your life and business is running systematically. A single, intensely focused coaching session is ideal for those who know exactly what they want but need help in solving a challenging problem or coming up with a new implementation strategy. The three-session package is perfect for those who want to learn and implement a series of proven, effective strategies that generates results quickly in all areas of your life and career. This is the most popular and economical coaching package. If you are serious about creating positive, lasting change in your life, this is the package for you. 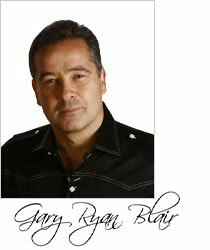 All coaching sessions are one-on-one with Gary Ryan Blair. A detailed coaching questionnaire must be completed. Sessions can be spread over the course of one year. Coaching is done via Skype or the telephone. Payment is due upon signing up and in full. Sessions last 45-60 minutes each. There are no refunds allowed. To sign up for Coaching for Results®, simply choose one of the packages above and proceed to the secure payment processing page.